A buyer checks out a pair of vintage jeans. Who doesn't have extra stuff lying around their home? 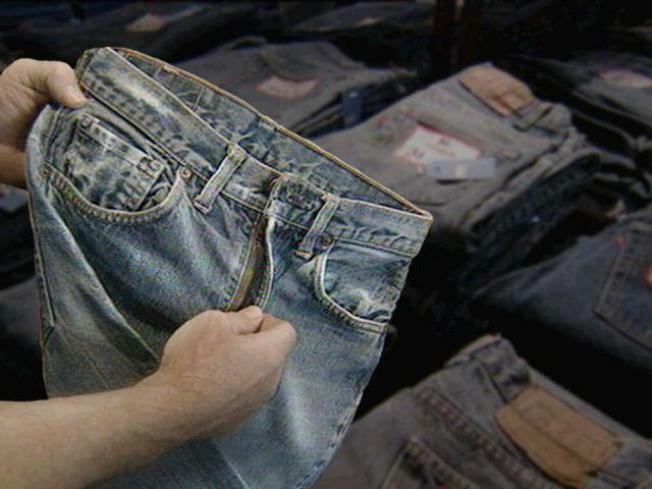 If you have a closet full of clothes, you may be able to turn your jeans into some green. Take Uptown Consignment in South Windsor with their jean buy-back program. Owner Barbara Capiniere explains: "Basically, you can bring in your jeans you don't wear anymore, they don't fit anymore and we pay you cash. Right on the spot." The program is different from "consignment" where you wait for your clothes to sell before you get your cash. But hold on to your "mom jeans" -- it's only for certain brands. The payouts range from $4 apiece for American Eagle and Gap jeans to up to $30 apiece for True Religion and Citizens of Humanity jeans. If you have old sporting equipment that's just sitting sidelined in your garage, here's an easy home run. Stores like Play it Again Sports in West Hartford will take it off your hands and even pay you a couple of bucks. Owner Elizabeth Hicks says they'll buy everything from ski boots to snowboards, from weights to skates. "It keeps it out of the landfill, it gets you a little bit of money, and somebody else has the opportunity to use it so you're providing equipment for somebody else who might not be able to do the sport." In the end, if turning your clutter into cash is too much work, you can always call Goodwill, the Salvation Army or another charity to come to you to pick up your tough-to-unload stuff. And even though they won't be coming with cash, you may be able to take a tax deduction.